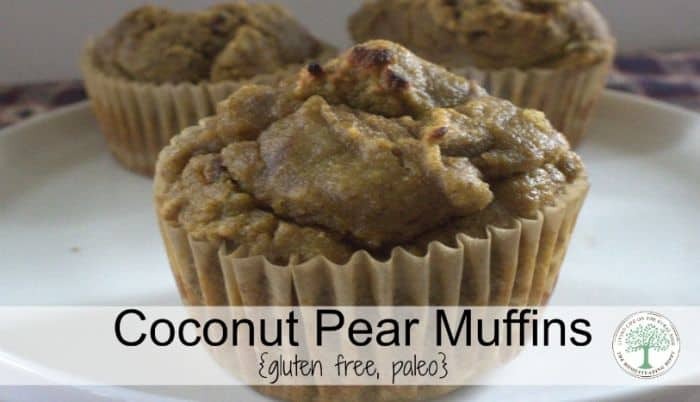 That is what best describes these coconut pear muffins. Seriously. When you add in the fact that they are gluten free, paleo and sweetened with honey, you have a combination that is just AMAZING! Pears are in season in the fall, and adding them to a coconut flour makes a taste bud teasing muffin that is full of healthy fats and fiber. Coconut pear muffins for the win, people! My husband and I have been eating clean paleo for about 6 months now. We started because some lab tests showed those terrible phrases such as “blood sugar levels high”, “blood pressure levels borderline” as well as hearing that nasty word, “obesity”. We knew we needed to make some changes, and fast. We wanted to be around to see our children grow up, our grandchildren grow up and even see our great-grandchildren. That wasn’t going to happen if we kept on the dietary path we were on. Sure, we were eating “healthy”. Real foods, whole grain breads and rice, whole grain pasta. Obviously, it wasn’t good for US. Our bodies couldn’t handle all the carbs we were giving it, even in the “real food” form. It was better than the fast food, mac -n-cheese and ramen diet we HAD been on 8 years ago…but still. The damage to our guts had been done, and healing needed to take place BEFORE even real foods would nourish our bodies. So, we began our trek on the Paleo diet, removing all grains, dairy and sugar from our diet. We even went so far as to remove coffee (who does that???!!!??) for the last 6 months. You know what? We have never felt better in our lives. My knees don’t bother me, even when the weather changes. I have been sleeping better at night, and having lost 50 pounds myself hasn’t hurt, either. So, needing more that just “meat and salad” or “eggs and meat” for meals, I had to make some switches as far as our menu. I mean, meat and veggies are great. They are the core of the paleo diet. BUT, after a while, it gets rather old. to fill us up for the day with healthy fats and fiber. I was able to use my homemade pear sauce from my neighbor’s tree, making them frugal. My kids liked them as well, so hands down they are a winner! You’ll need the recipe for pear sauce, some homemade vanilla, coconut flour and coconut oil. 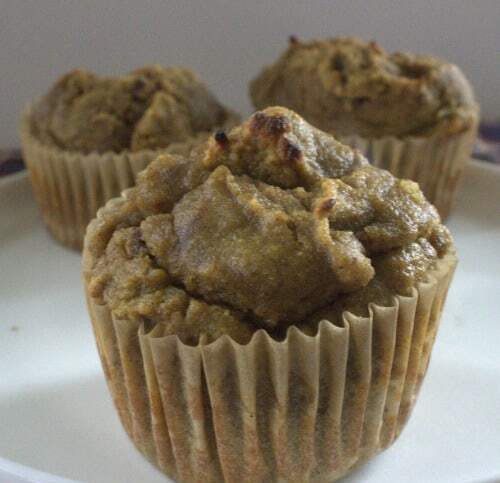 Add some farm fresh eggs, baking powder and cinnamon and you have the makings for a delicious morning! Or snack, or anytime of day! What is your favorite treat for a fall day? Be sure to pin this for later! Pears are in season in the fall, and adding them to a coconut flour makes a taste bud teasing muffin that is full of healthy fats and fiber. Coconut pear muffins for the win, people! In a medium sized bowl, crack the eggs and beat until fluffy. Add the vanilla, honey and coconut oil, and mix with the eggs. Stir in the pear sauce. Sift the coconut flour in a separate bowl, removing any chunks. Add the baking power and cinnamon to the sifted coconut flour. Mix the dry ingredients into the wet and stir well to combine. Allow to sit while oven begins to preheat to 400 degrees. Line a muffin pan with muffin papers, or grease with coconut oil. Scoop the batter by 1/3 cup full into the pan, filling each 3/4 full. Bake at 400 for 18-20 minutes, until soft but "springy" on top. The top should spring back when gently pressed on. I was looking for egg-free recipes and came across this recipe. It sounds really good, but was a bit amazed when I started reading the directions as first step says to beat the eggs.. You probably have forgotten the eggs from the ingredient listing? THANK YOU for pointing that out for me! I am so sorry it was missed!!! I just made these with a flax egg substitute and with a baking powder substitue of 1 tsp = 1/4 c molasses + 1 tsp baking soda. They are ok, really moist. I’m going to have to cut down on my wet ingredients next time like maybe 8 flax eggs instead of 10. They also are very bland. I added raisins to some of them with helped add a little sugar. I also added some palm sugar to the second batch. I think those will be better. Definitely worth a try and tweaking it to fit your allergies. I can’t have eggs, corn, soy, wheat, or yeast so this can fill that missing slot for me. Hi. Just wanted to check is it a typo or is it actually 10 eggs?